We are offering superior range of plate heat exchanger which performs flawlessly and is at par with international standards. These types of heat exchanger uses metal plates to transfer heat between two liquids. Apart from this, we can custom design the range as per clients’ requirements. The wide spectrum of plate heat exchanger is widely appreciated for high performance, durability and reliability. It mainly uses metal plates for the transference of heat between two liquids. As soon as the liquids spread out over the plate, they are exposed to a much larger surface area. This further supports the transfer of heat and increases the speed of the temperature change. 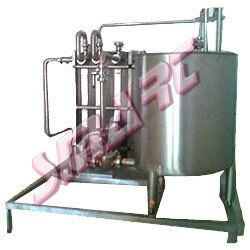 They are widely used in milk, ice cream and butter milk, HTST pasteurizers for milk plants.